These gatherings are fancier than ever. Academic conferences used to be in universities. Yet the last annual meeting of the American Association of Geographers, the world’s largest geography conference, was in the Sheraton Boston, a four-star venue. Many now also feature elaborate social programmes. Those who attend World Water Week must choose whether the cocktail reception on Monday night, the royal banquet on Wednesday night or the “mingle and dance” on Thursday night is the conference’s main see-and-be-seen event. 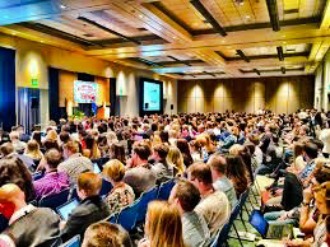 What used to be the sharing of knowledge between a small number of people, academic conferences these days boasts of thousands of attendees and is proving to be a costly investment for those who want to further their education or career. When in the past the participants and the organizers didn’t care much about the venue themselves, today’s gatherings are often held in fancy hotel ballrooms or events hall that is equally expensive to lease themselves. No wonder people have to pay a hefty amount of money for registration just so they can attend these academic conferences. Most conferences I’ve attended have been in the $800 to $1,200 range (and usually after using a promo code). Though much of the information you’ll pick up could be considered “invaluable,” I believe that there are times when conference costs are needlessly inflated. I’ve been to conferences that have had copious high-end snacks and drinks provided around the clock, and one that had an absolutely ridiculous flash mob in the middle of its networking happy hour. There are various conferences you can attend to not just in the academe. In the field of marketing and business, there are a multitude of conferences as well that are just as expensive as the academic ones if not even costs more. Like the problem with academic conferences, they are held in posh hotels and venues that cost an arm and leg already not to mention payments given to the speaker. It is mainly the primary obstacle as to why many can’t afford to go to these conferences even if it can take them up the corporate ladders or eventually free them financially. After all, you have to plant first before you can sow and at the rate these conferences are being priced right now, it’s either fewer people can attend them or the public is forced to shell out more money in order for them to reach their dreams.